A native of Moultrie, Georgia, Mrs. Parker graduated from Colquitt County High School were she was an active member of the A Cappella Choir and the cheerleading squad. She attended college at Georgia Southern University where she was a member of the All Girl and Coed Cheerleading teams and was named Most Outstanding Health and Physical Education Major of her graduating class. 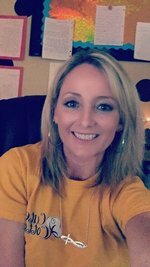 In 2002 she began her teaching career as the PE teacher at Norman Park Elementary School and served as the head coach of the Colquitt County Cheer Program. During her coaching career she oversaw the competition and spirit programs at both the high school and middle school. In 2012 she moved to a new position at CA Gray Jr High. There she taught health and PE for one year before moving into the classroom as the 9th grade ESOL teacher. She has co-taught in all content areas at the high school level and is currently the ESOL teacher at Cook County High School where she co-teaches ELA, Algebra, Geometry, Government, and Biology as well as a resource class for ESOL students. Mrs. Parker has 2 sons, Cayden and Carson and currently resides in Moultrie. In her free time she enjoys spending time with her kids, singing and crafting.